When you first see the stunning views and gorgeous rolling fields of Bohuslän in West Sweden, you’ll suddenly feel your spirit lifted. The greenery and stunning landscapes are utterly consuming. Anyone wanting an escape from life and a return to the simplicity of the natural world should seriously consider a visit. 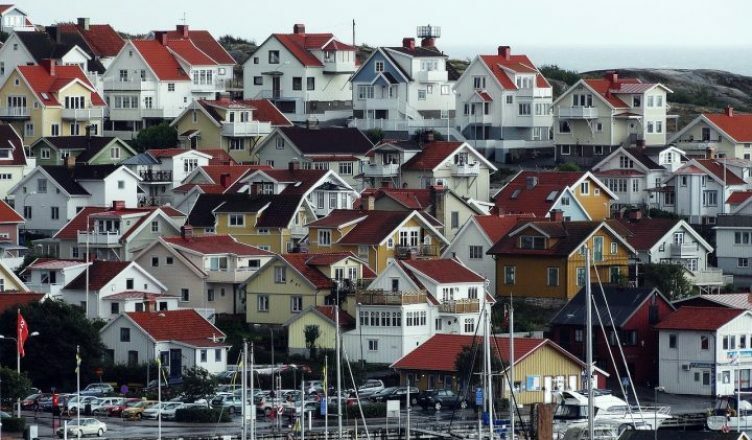 Gorgeous Bohuslän is an unspoiled coastal area, lined with pink granite rocks and with clear skies for miles around. There are many small villages and towns dotted around West Sweden, a well as over 8,000 islands, providing ample opportunity to explore. For someone wanting to visit a small town and stay in an original Swedish hotel dating back to 1904, Strandflickornas Havshotell in Lysekil is the perfect place. You can choose from one of 24 charming rooms within the hotel or two modern sea-level studios which look out onto the gleaming waters. A double room for one night starts at a cost of around 1100 SEK (Approx £110). One of the many exciting activities you’re able to do while in West Sweden is a mussel expedition. 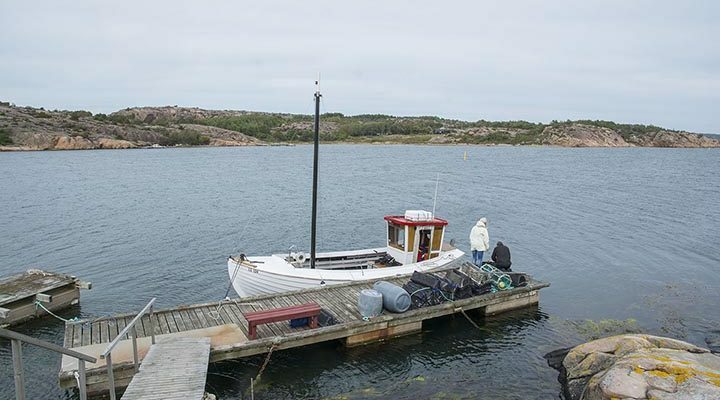 On a small wooden boat from 1952, you’ll travel from the North Harbour in Lysekil to the mussel farm to gather your lunch – seeing firsthand how mussels and oysters are grown and then harvested. 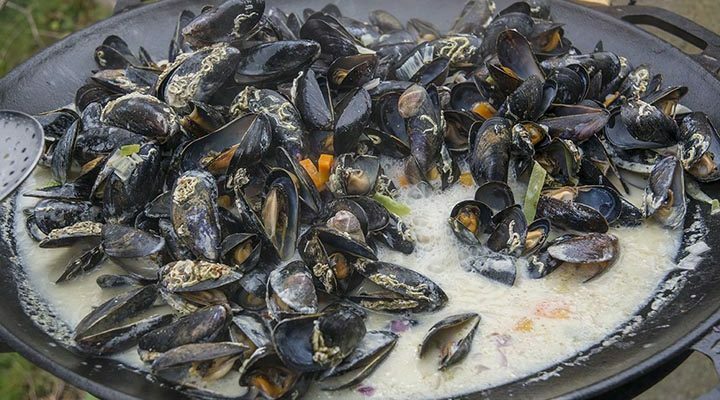 After gathering only the best, you’ll travel to a private island where you can sample the freshly caught Japanese and Swedish oysters, and your bounty of mussels will also be cooked in a gorgeous white wine and cream sauce packed with carrots and onions. The organisers of this trip are so friendly and attentive they add to the experience, and make it so uniquely Swedish that nowhere else could compare. The tour takes around three hours and costs 850 SEK (Approx £85). 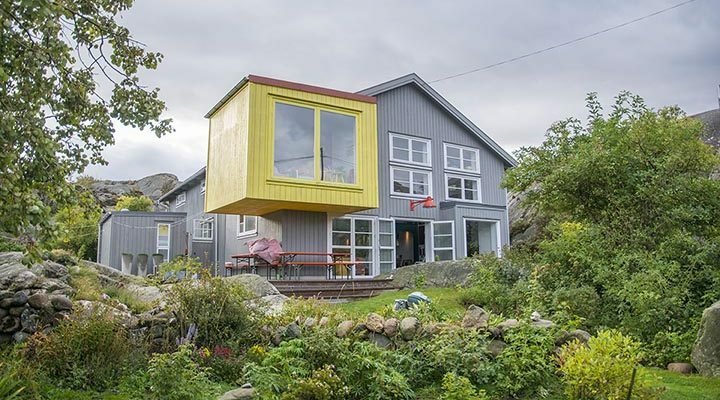 For anyone wanting to really travel into the rural landscape and escape reality completely, Lådfabriken is the place you need to go. Only 30 meters from the sea in a gorgeous fishing village, the building was originally a small factory, but has now been converted into a uniquely stylish bed and breakfast with 4 bedrooms all with their own en-suites. 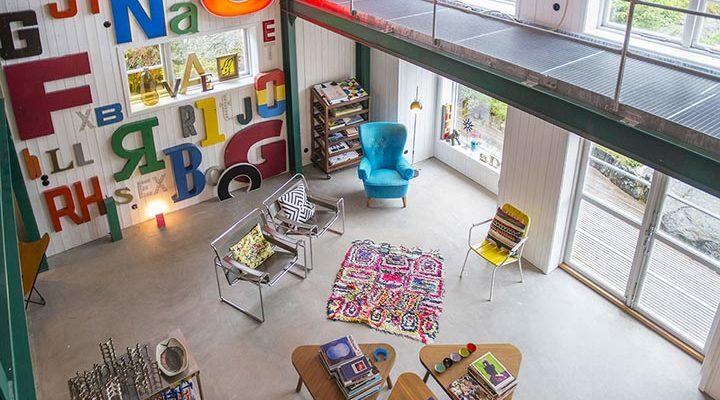 The owners have a very keen eye for design and an even keener eye for quirky collectables. The moment you step foot on the driveway there are stunning photos to be taken from any angle. Any Instagram fanatic would have a field day (or two) capturing every inch of the building inside and out. The outdoor space is just as stunning, with the village just a few minutes walk down the road. The cool clear water at the bottom of the winding garden just dares you to take a little dip. All rooms can sleep two people at a starting cost of 1650 SEK (Approx £165), which includes an exceptionally intimate experience with the two owners, as they do everything for you. Also included is breakfast with seasonal fruit from the garden, the use of bicycles, the use of kayaks, and an amazing sea view from the yellow ‘light-room’. 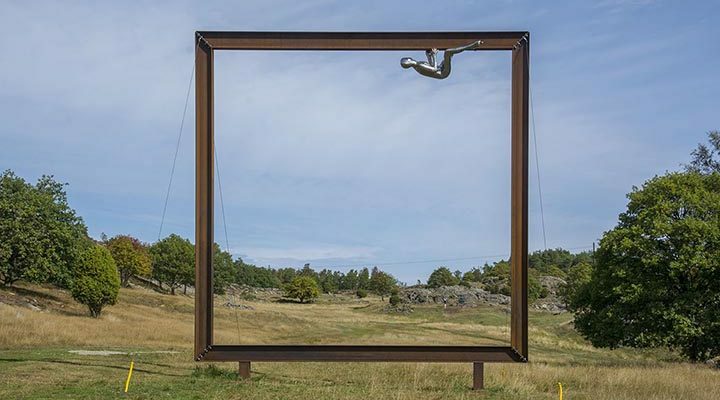 If after seeing all these amazing places you find yourself yearning for more, a trip to Skulptur i Pilane would definitely be the cherry on top. For the more adventurous types, you can hire bikes from the nearby tourist information in Skärhamn and follow the bike trail to the sculpture park, which is roughly seven miles away and takes 45 minutes. There are very few hills and most of it is level ground, going through wonderful cycle paths with gorgeous views and meandering forest trails. Pilane is one of the most beautiful historical places you can visit in Sweden because of the man-made art which is surrounding you but also because of the stone circles which date back to the Iron Age. 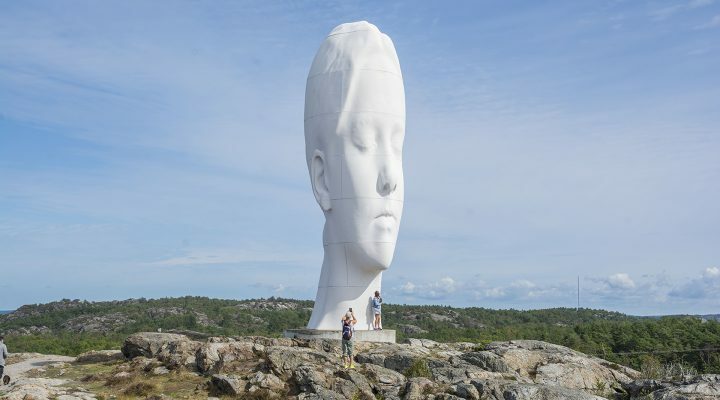 The pieces of modern art from many famous artists change each year, apart from the giant head at the very top of the hill named ‘Anna’, which was designed and created by Jaume Plensa. When stood at the very top of the hill underneath the chin of ‘Anna’, looking out over Sweden and the sea, you really do feel the sense of scale and the enormity of the world. Entry into the park is 120 SEK (Approx £12) for adults and under 15s go free. To extend your stay in Sweden, look into visiting the amazingly cultural and open city of Gothenburg just an hour away from the west coast for a city break you will not want to pass up on.